COVET. | Fleur d'Elise: COVET. 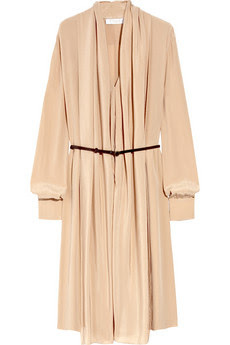 Introducing Chloe's silk crepe de Chine shirt dress. This is the epitome of my taste in clothes. Simple, soft, understated, yet still luxe. (Not to say this always translates. Sometimes it comes off as just understated and mostly boring.) This dress is also the perfect example of why I love Chloe; the perfect balance of glamor and practicality. I just read Net-A-Porter's description of this dress and my statements are confirmed: "Perfect understated elegance..." Judging by the photos on Net-A-Porter, it looks even better on than when it's on the hanger. There are two reasons I will never own this dress: 1. There are only size sixes left on Net-A-Porter. Oh, and 2. It costs $1,990. It comes with the little leather belt, so I guess it's like getting two items for, well, $1000 a piece. I think I will try talking my dad into buying this as my wedding gown... I can already hear him laughing at me. I guess I will be happy with Chloe Intense. At $98, it's a tad more affordable, and it smells the way I like to imagine the Chloe design firm does. If cashmere and silk had a smell, it would be this. 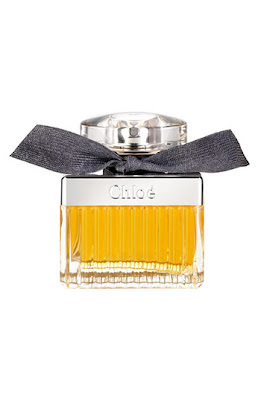 I LOVE Chloe perfume...its the reason I named my daughter CHLOE...no, seriously, lol...I loved the perfume so much...I named her after it!! lol, Collette! Chloe is a pretty good name to begin with and seems fitting for the daughter of a Collette! I am definitely considering the name, haha. I wish there was a scratch and sniff feature on your blog--for the perfume! WOW! i love that shade of peach! its so beautiful! covet indeed! Chloe Intense is a wonderful scent, it's so feminine! It's beautiful - love the shape, love the belt, lovelovelove the colour. Shame about the price!